Let's start by getting one thing straight, I'm not claiming to have invented these! Originally I thought they'd started out on Split Coast Stampers, but after googling it, they're all over the place! One thing I haven't seen is a video on how to make them, so I thought I'd give it a shot! 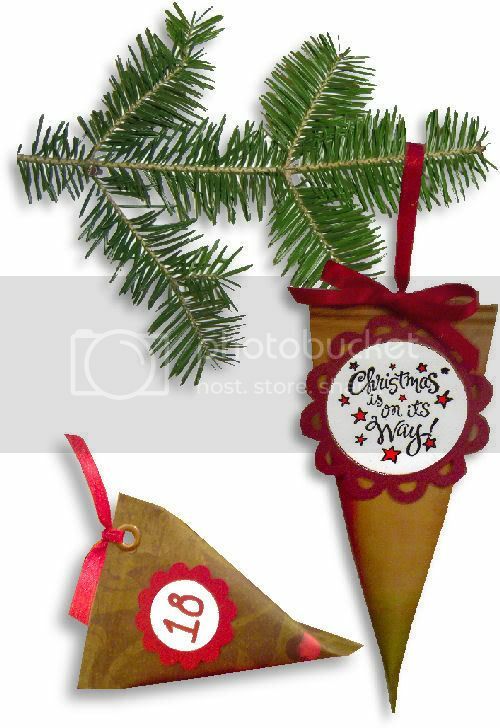 These are really simple to make and look wonderful hanging on the tree or piled up in a big bowl, ready for the morning scramble to find the next package to open! I use circles and scalloped circles on these that I have cut on my Cricut with SCAL. Hopefully many of you downloaded the scalloped shapes when they were a freebie on my blog. If you have the scalloped Nestabilities dies, you could use those instead! These are really fun to make, so why not try 'em? Enjoy! Love it Dan! Another fantastic video from you! I'm going to borrow your idea to make up little bags of treats for my son to give out to his school friends with his Christmas cards this year. I'm sure the kids will love them! What a great tutorial. I am going to make these for my granddaughter.Thanks so much for all the time you put into these videos. What a fab idea, they remind me of Jubblys! I haven't got a paper crimper but I am going to start making them today (and order a crimper too). Cant get hold of hoards of matches boxes anywhere nearby to make one of those sort of advent calendars so I think Im going to give this a try..
no time this morning to watch the video but I shall pop in later.. Thanks Dan! Well done again! That was really easy to follow, and well presented. I've seen other demo's of these sour cream containers, but none were so close up or easy to follow, so I thank you for that! I think I like this idea for treats for school when the kids have a birthday- instead of using more expensive scrapbook paper I might try inexpensive colored copy paper. If they are going to rip them open anyway, might as well make it as cheaply as possible! And I can still print out the birthday announcement and attach it to the front. Great Dan, haven't used my paper crimper in years. Will definitely be making these, it will vindicate not throwing the crimper away! First time I've looked at your videos Dan - VERY impressed at your creativity and generosity - THANK YOU for sharing. This is terrific! I would never have thought to make these awesome little containers into an advent calendar...thanks so much for the great inspiration and directions. Thank you Dan, love this idea, will be making some to put on the tree. Another fantastic idea! Great for kids party bags too this is an idea I will be using for gifts all year round! Another brilliant video. So easy to follow. I love the crimping idea on the containers. I followed your wreath video and made my own wreath, thank you. Wow, they're lovely. Something more for me to make! Thanks Dan! I have been wondering how to make these. Again, you explain things so easily I think I can do it! These look so much fun!! I managed to have a play yesterday morning even before I had breakfast. I made 3 in no time at all. I've told my daughters they are not getting a conventional advent calender this year. I will suggest they make them for the school christmas fairs too. Brilliant as ever Dan! Thanks a lot, such inspiration you give us. Another fabulous video tutorial thank you. These are such a brilliant idea (and best of all - so quick and simple to make - well at least you make it look quick and simple LOL). Here is my take on the project - I have made more than one! Love this ideas. and love your blog, keep the creativity up Dan!! What a great video, and cute idea. Video Tutorial - Santa Ornament Card! Holly Jolly Monday Freebie Madness!